You are leaving the populated continent to discover new lands and become a pioneer of colonization. When you settle in the archipelagos of the islands, you have to expand your colonies and defend yourself against a new threat. Strategy, colonization, diplomacy, production, trade, wars – these are the possibilities that Anno 1602: Creation of New World, a real-time strategy game, offers. The game, classified as a progressive strategy, takes a different approach to the genre by combining the classic solutions with building a colony, diplomacy, trade, as well as both land and naval combat. 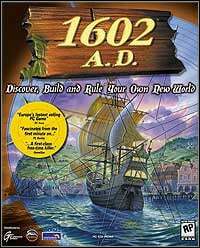 The year is 1602, the future is uncertain, cities overpopulated, poverty and hunger common. A group of adventurers decided to look for a New World and a better life. In the game, we become a discoverer of new lands and a colonization pioneer. There are almost 700 randomly generated islands with varied terrain shape and natural resources for us to explore, as well as 90 various buildings and over 30 professions. There is also a 5-level training campaign for beginners. The tutorial is characterized by a high-quality AI that adjusts the computer behavior to the ability of the player. The multiplayer allows up to four players to play via LAN and two via the Internet. Game score 8.7 / 10 calculated out of 1576 players' votes.